"[Easton] was a singer’s singer: a consummate professional on whom one could count for a faultless performance…." "There really is a lot to admire: a steady and attractive sound over the required range, with little change over the years; good legato and dynamics; more correct pitch and rhythm than most of her contemporaries; excellent enunciation (one could write down the German texts from the two little-known songs by Erich Wolff that she recorded with Gerald Moore); care over phrasing; skillful management of portamenti…. [Eastons] relative lack of posthumous fame may have to do with the labels for which she recorded in her prime: Vocalion, Edison and Brunswick." 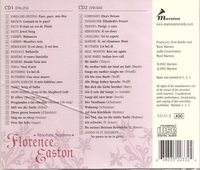 “Florence Easton was one of the most versatile singers of all time. She sang no fewer than 88 roles, covering a wide range of styles and periods, from Mozart, Meyerbeer, Gounod, Verdi, Wagner, Puccini, Strauss, Schreker and Krenek. In Wagner she sang virtually every soprano part, large and small from Senta onwards, with the exception of the GÖTTERDÄMMERUNG Brünnhilde. Florence Easton excelled, rivalling Lilli Lehmann [in the respect of singing dramatic roles]. Her high international reputation, founded mainly in Germany and North America, was almost unique for a British singer of her time. She could move easily through all stages from the light coloratura to the Hochdramatische, from girlish romanticism to powerful Wagnerian and Straussian drama. One of the most important Wagnerian records was made for HMV in 1932: ‘Heil dir Sonne!’ from SIEGFRIED (her best recording in her own estimation). In 1933 HMV recorded six sides of Lieder and songs for Victor, accompanied by Gerald Moore. It was Richard Strauss who coached Florence Easton as Elektra and Sophie which she presented in English on a tour in Great Britain and in German in Berlin. She continued to expand her repertoire, the new role including Salome (again coached by Richard Strauss) and Minnie, singing with Enrico Caruso in 1913. Easton made her successful Met début as Santuzza in 1917. She remained at the Met for 12 seasons, singing 41 roles, but it was her performance as Saint Elisabeth in the staged version of Liszt’s DIE LEGENDE VON DER HEILIGEN ELISABETH (1918) which set her into the first rank of Metropolitan stars.